Luke picked up his Illinois Canoe Trailer today after driving 6 1/2 hours one way. 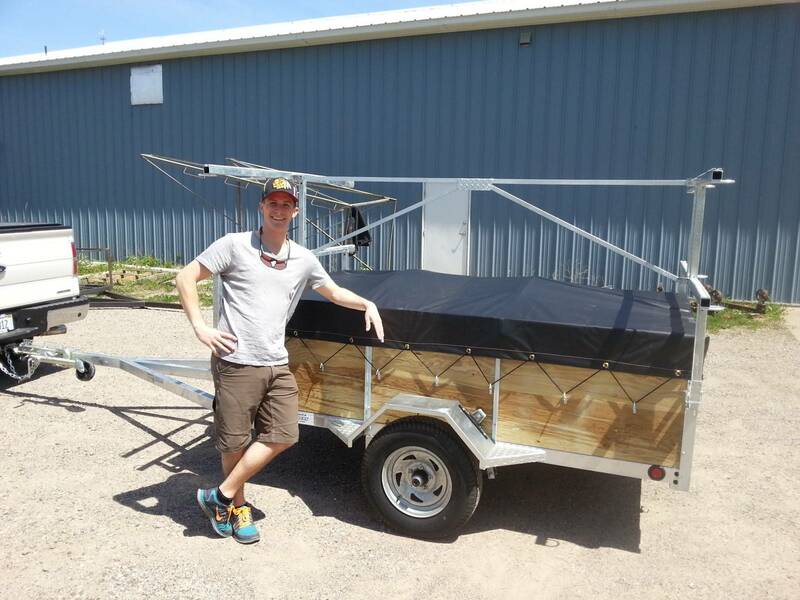 Luke choose our standard 4 place canoe trailer with 24″sides. He upgraded to the 8ft tongue versus the standard 6ft tongue. We recommend an 8ft tongue for canoe trailers that will haul canoes that are 19ft or longer. This canoe trailer with 24″ sides is capable of hauling 1700lbs worth of gear. We use a 2200lbs axle on 13″ tires with galvanized rims. A 24″ side canoe trailer can haul 80 cubic feet of material. All of our canoe trailers are handmade from scratched and built to order please call us to see if we have any trailers in stock, sometimes with do! A hot dipped galvanized steel canoe trailer is maintenance free. It will not need to be sand blasted and re painted. Galvanized is a better quality than paint and will last decades from rusting. Our marine treated plywood will last on average 15 years and we recommend that you use some Thompson water seal to extend the life of the plywood beyond the 15 years we are averaging. Our made in the USA 18 oz high tear vinyl canvas is made to last. Its also made by family owned small business. We hope to hear from you soon about our canoe trailers and Thanks for your purchase Luke! Check out our reviews on paddling.net at the below link. Details of Luke’s 4 place canoe trailer….